Join us in protest of Southern California Edison’s plans to bury 3.6 million pounds of hot nuclear waste 108 feet from the beach. Burial of the first of 75 nuclear trash cans may happen as soon as tomorrow. 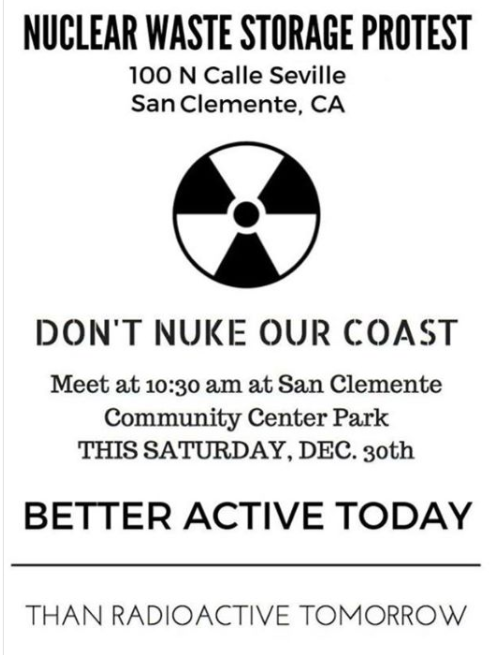 Please join us and other concerned citizens in a peaceful demonstration in protest of Southern California Edison’s plans to bury nuclear waste inches above the salt water table in thin-walled steel cans 108 feet from the beach. The waste inside each nuclear trash can is deadly for millions of years, yet the cans themselves are only guaranteed to last 25 years! Visit the Facebook event page HERE. You’ll meet other concerned citizens and members of Public Watchdogs’ board of Directors. Attendees will be briefed on the status of the burial, and learn about the Public Watchdogs lawsuit to revoke the permit allowing the waste and to force Southern California Edison to close down its nuclear waste dump. Download a pdf of the poster here: Protest Flier 8.5×11. Thank Charles, Nina, Bob & ALL! We are over 8,000,000+ people on coast near I-5! Don’t mind glowing, but NOT DUE TO NUCLEAR WASTE FUEL! No more glow in the DARK pool parties…burial ceremonies! Or lack of representation on Decommissioning Committee! if never started Jan. 1st 2018: LEAK! We ARE NO LONGER WEAK!